It’s no secret that Samsung’s working on a handset with a pop-up camera, though it would seem the mechanism itself is a lot more intricate than originally thought. What we mean by that is that there’s a dual-camera built in that rotates, after extending, to cater to the front of the device. At least, that’s according to a 3D render that surfaced on April 4, showcasing the ever-so-complicated camera setup — which was later corroborated by esteemed Samsung tipster Ice Universe, who has a remarkable record when it comes to being a proverbial fly on the wall in the firm’s China HQ. The camera has two main motions: it’s mounted on a frame that slides up when the front-facing camera is toggled, then the smaller camera module itself flips around from the rear of the handset, once the frame has finished extending, to focus on what’s happening on the user-side. That may sound all well and good, but in reality, it’s just another thing that can go wrong. A moving component, regardless of the device it’s being used on, is more likely to fail than a static one — and there are two on this unit. If just one fails, the front camera is rendered non-existent. 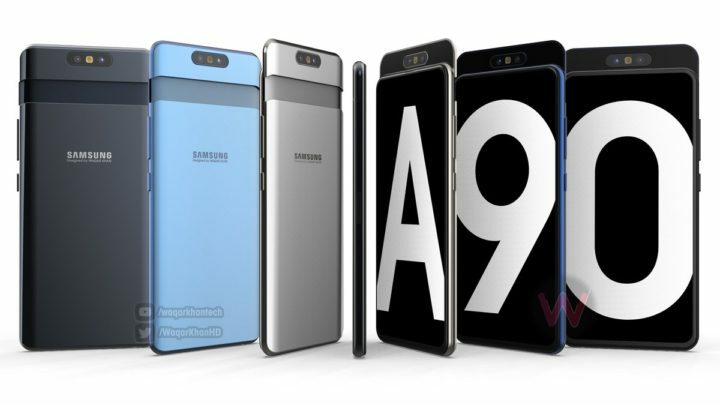 Sometimes it’s best to stick to the basics, and that’s what Samsung is said to have done for the rest of the handset, which has been dubbed the Galaxy A90. It’s believed to feature a 6.7-inch screen, an unannounced Snapdragon 700-series CPU, a minimum of 6GB of RAM and a 3700mAh cell. I had the chance to try out the Vivo Nex, another smartphone with a pop-up camera, and it worked well for the most part; though the motor was a little too slow for face recognition, so I’m not sure how the Galaxy A90 will fare as it has to both extend the frame, then flip the camera around. Still, mounting the front-facing camera on a retractable fixture is one way to achieve the all-screen appearance Samsung so desperately craves — so one could assume it’s some sort of preliminary test to see how the market reacts in anticipation of a launch on a flagship device. So S11 will have this camera mechanism too ? Can we set default camera mode ? Always fron or always rear after slide ? The camera will flip automatically ? Or I need to rotate it ? Why you didn’t create news about this ? That’s a good concept but it’s not real. I’m a design engineer myself and there is no way that that is anything more than a fans concept. You cannot get a workable servo motor in that thin space to flip the camera and if you did it wouldn’t last a week. It would be too small and fragile. In early concepts Ice Universe gets as much wrong as he gets right. It’s a bit like a fortune teller, people only remember the right guesses. This definitely isn’t one of those. You’ll be surprised when they launch it. Preatty much it’s like on video. I will be very surprised, and if it is like that it will break far to easily. This will not be the final design, unless Samsung want to have a million problems with mechanical failure. It’s probably fan made video..
Can you please give me a link brother? Sure. Second paragraph of the above article. Just click on the word ‘corroborated’ and it’ll take you to Ice’s tweet. You’re right, it’s not real and not even a viable design from an engineering viewpoint.